Yesterday I shared my swatches and review of Lina Nail Art Supplies Make Your Mark 08 stamping plate (which is also available from the Hit The Bottle website) and in that post I shared a little sneak peek of some stamping polishes I received to swatch. 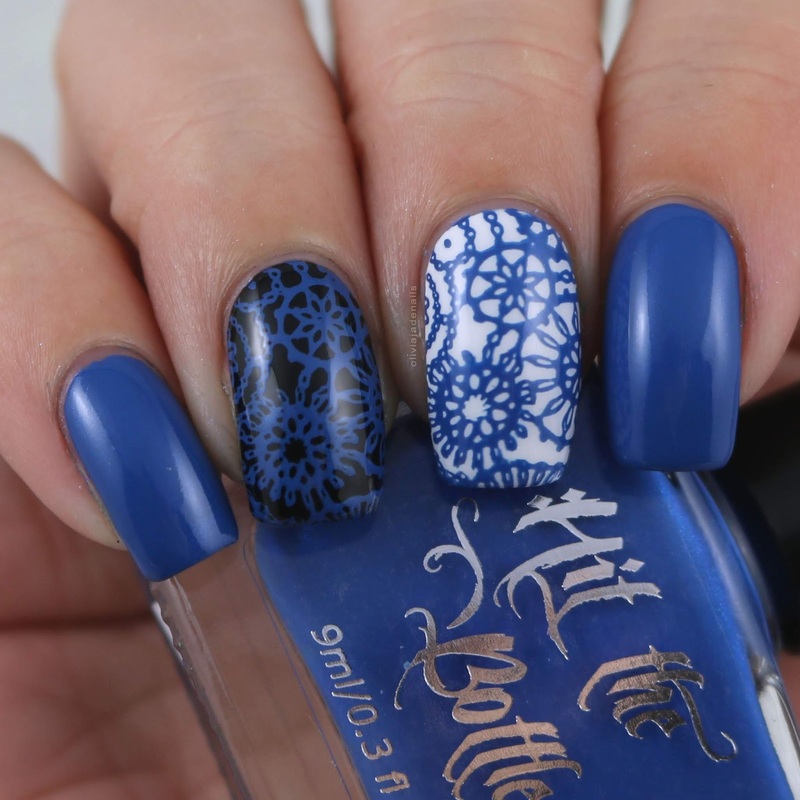 Normally when I do swatches of stamping polishes I do them over a black and white base but I was inspired by Serene's (Copycat Claws) epic Hit The Bottle post (which you can find here if you missed it) to switch it up. 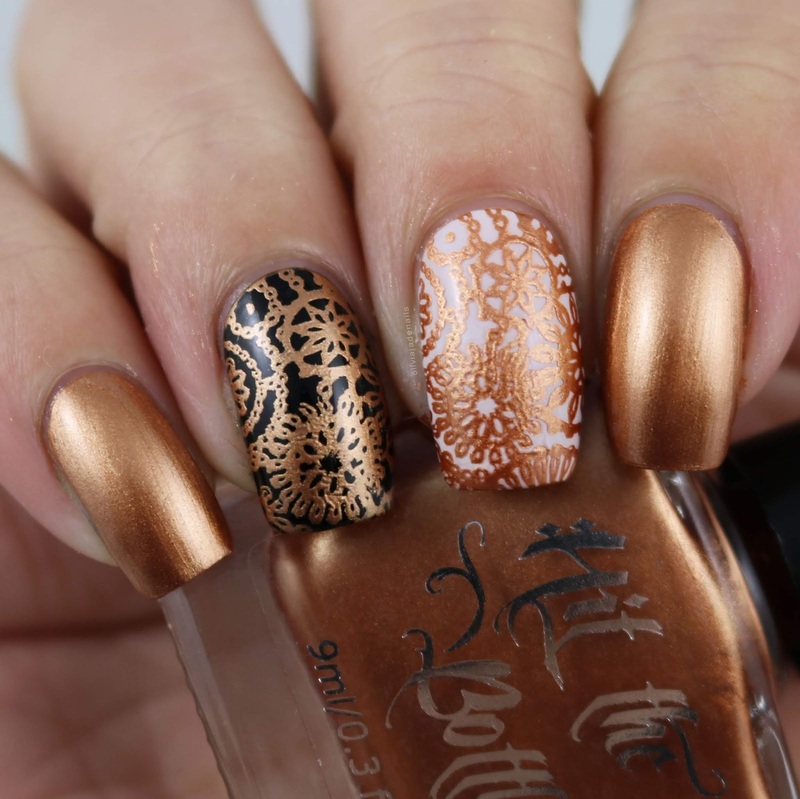 I loved that Serene also shows the stamping polish on a full nail so I have totally copied her. 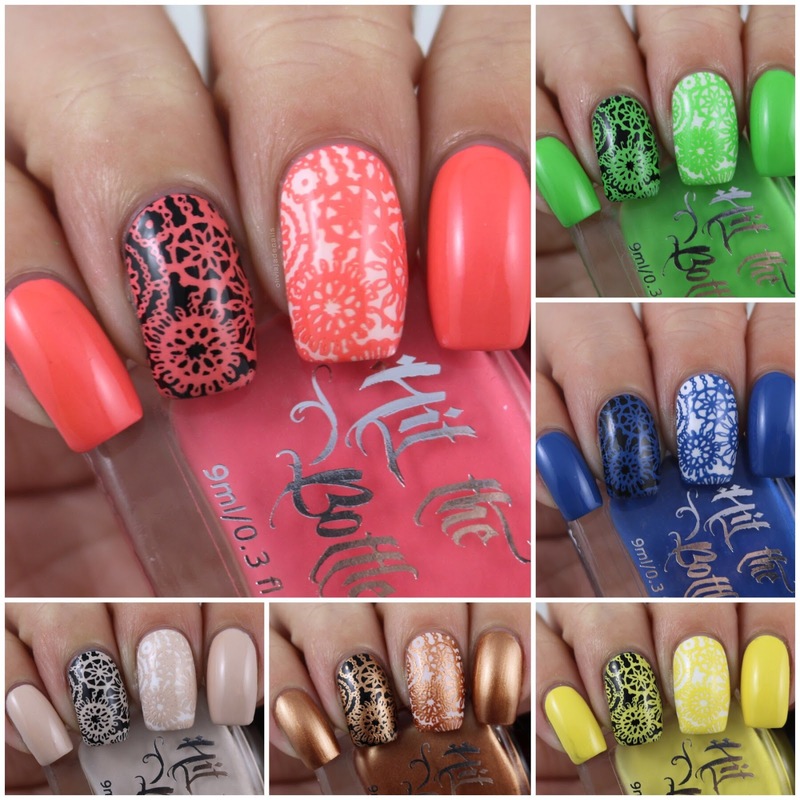 Her post also makes me want to re do all of my swatches of my stamping polish collection from Hit The Bottle. I'm definitely not doing that today. Today I have my swatches and review of the new Halloween themed stamping polishes as well as three stand alone stamping polishes. Let's start of with the Halloween themes polishes first. Why? Well why not? There are three polishes in this collection. Beware The Bates Motel is a rich, warm, mid-toned blue polish with a shimmery creme finish. The shimmer is really subtle in this polish but it is really pretty. As you can see from my swatch this polish stamps beautifully over both like and dark polishes. In terms on wearing it on the full nail it is completely opaque in one coat, however I did experience some splitting when I applied top coat so needed two coats for my swatch. Peaches 'n Scream is a pale yet bright peach/coral polish with a creme polish. Now I didn't pay too much attention to this colour when I applied it but I did noticed that it appears to be a different colour on the nail than it is in the bottle. I have a feeling that top coat effects this. Either way it is a nice colour and great for the warmer months. Again it stamps beautifully over both light and dark colours. My swatch shows one coat on the full nail. Slime After Slime is a bright lime green polish with a creme finish. I really do sound like a broken record here (sorry I don't mean to) but this polish stamps well over black and white. I also used one coat for the full nails. Now onto the three new polishes. I'm not entirely sure when these were released but they are all really pretty and are great addictions to anyone's collection. 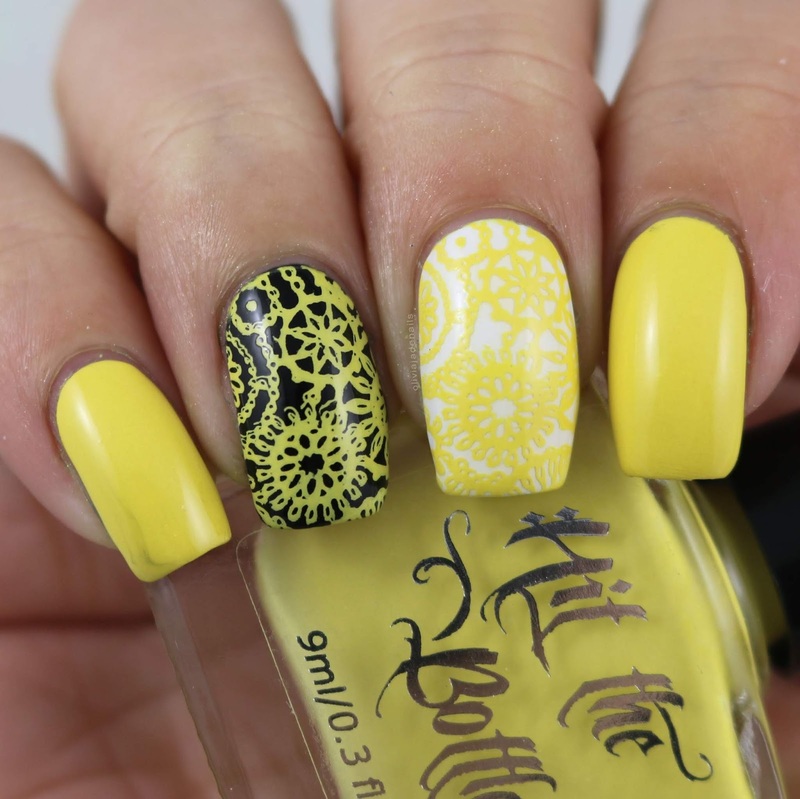 Banana Colada is a bright yellow creme polish. This is perfect for summer! Personally I prefer this one over black (or any darker colour) but it does work over white. In terms over wearing it on it's own - it is opaque in one coat however the formula is quite tricky to work with. Bronzed Aussie is a soft metallic bronze polish. In true metallic form, this doesn't photograph well. It is so much nicer in person. It's such a great colour, stamps well over black and white and is opaque in one coat. Whiskey Latte is a pale creme/buff creme polish. I have been looking for a good creme polish for such a long time! I am excited to play with this one some move over other colours. As you can see it stamps beautifully over black and white and is opaque in one coat. I am a huge fan of these polishes. In true Hit The Bottle style these polishes all stamp beautifully over both light and dark colours. I'm not 100% sure if I would wear a lot of these as a full manis but that is what regular polish is for isn't it? All of these polishes are available now from Hit The Bottle.